Scintilla dispenses bactericidal toilet seat wet wipes. The specially impregnated wipes kill 99.99% of bacteria found on toilet seats, are active against selected viruses and conform to European bactericidal and yeasticidal standards. 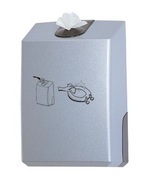 Simple and effective, the toilet seat wipes are dispensed via a single-wipe dispensing aperture to minimize waste. Scintilla cares for the wellbeing and comfort of the end user. The unit is available in Kennedy’s full range of attractive finishes.